Item # 283620 Stash Points: 1,999 (?) This is the number of points you get in The Zumiez Stash for purchasing this item. Stash points are redeemable for exclusive rewards only available to Zumiez Stash members. To redeem your points check out the rewards catalog on thestash.zumiez.com. The Karlie pastel pink sweater from Almost Famous can be worn as a sweater or a hoodie to give you an array of outfit options. This textured fisherman knit jumper offers a slouchy fit with a large hood while the lace-up v-neckline refines this classic look. 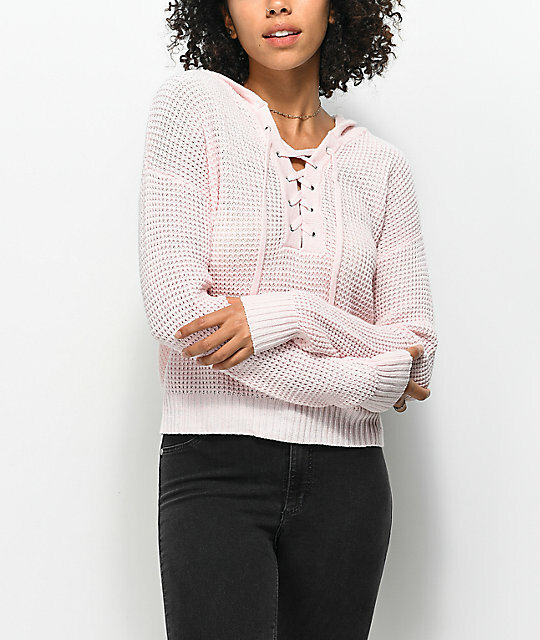 Karlie Lace Up Light Pink Hooded Sweater from Almost Famous. Lace up v-neckline w/ silver grommets.